Ma Bagalamukhi is the quintessential tantric devi. She exudes great beauty, harmony, and vitality. She is hypnotic, and has the power to hold both mortals and the elements to Her sway. Her devotees turn to Her when they have evil spirits to ward off or success to be sought in mortal disagreements. Her temples could be found in the deepest recesses of the subcontinent, where Her devotees flock at especially trying times of their lives to seek Her divine intervention. Her usual iconography has a strong element of yellow, the colour of fecundity and vitality. Hence, each of the finishes this murti comes in has a distinctive gold-coloured tone complementing the rest of the shades of brass. Her stance is determined and fierce. Her leg is raised; with one hand She seizes the asura (one of demonkind) by the tongue, while She raises a goad with the other. The pulling of the demon's tongue by Bagalamukhi is both unique and significant. Tongue, the organ of speech and taste, is often regarded as a lying entity, concealing what is in the mind. The Bible frequently mentions the tongue as an organ of mischief, vanity, and deceitfulness. The wrenching of the demon's tongue is symbolic of the Goddess removing what is often a perpetrator of evil. She is ready to bring down Her sacred goad on the head of the asura, who and whose kind stand for all that is adharma. He is on His knees before Her, a sword and a shield in His hands that failed to serve Him well. The slight bow of Her head gives away that She eyes Him ferociously as She prepares to strike Him. 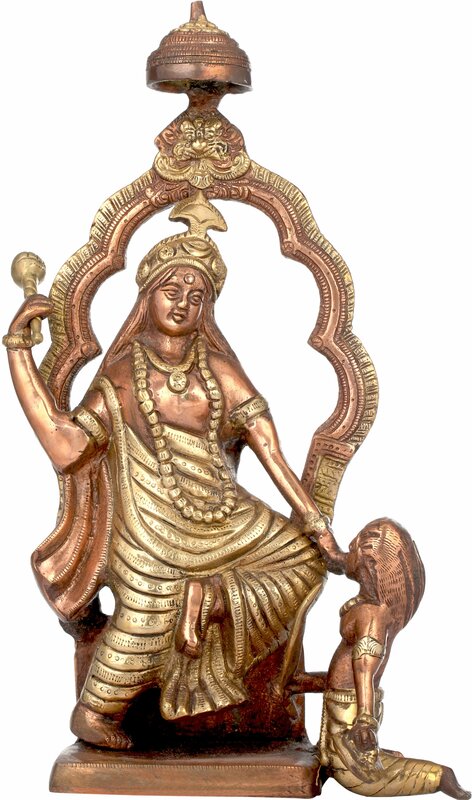 Her divine appeal has been captured with superb skill in this brass sculpture. Beneath the sumptuous gold crown cascades Her ample tresses down Her back. Her chunky shringar is layered over the sublime folds of Her saree. What sets this portrayal of the mahavidya apart is the stunning aureole it comes with. Perfectly symmetrical, the thick brass curves are densely engraved, adding complexity to the composition. The parasol atop the aureole rounds it off. Note how the asura has been placed by the edge of the base, as if to indicate that He is outside the purview of the dharma She embodies.